One night when I was five years old, my mother came to my room and roused me from my sleep. She asked if I wanted to see Toni Tucker, my teenage babysitter, dressed for Prom. I did not know what Prom was, but when I padded downstairs and saw Toni standing at our front door, I understood why my mother woke me. Toni wore an emerald silk gown with dyed-to-match shoes. Her pony tail was replaced by a bouffant, earrings sparkled from her ears and she wore ruby red lipstick. I thought she was lovelier than anyone I had ever seen. She looked sophisticated…grown up…and quite beautiful. When I was a high school freshman, I was asked to the prom by a boy I barely knew. I accepted and then was faced with the formidable task of finding a prom gown. I will never forget the search. My mother and father accompanied me to Forbes and Wallace, where we found the perfect pink and white confection of organza and crepe. When I saw the price tag, I gasped in shock. The gown cost thirty dollars- far too much money for a dress I would only wear once. However, to my great surprise, my parents gladly agreed to the purchase. I’ll never forget the feeling I had when I looked in the mirror the night of the prom. I had never worn a long gown before. I felt… sophisticated…grown up…and quite beautiful. Proms are a rite of passage for most American teenagers, and for most of them, finding the perfect attire is almost as important as graduation. I thought of this a couple of weeks ago as I made a few easy alterations to a gown for my niece, Mikaela. She is a tall and blond, and her choice of a bejeweled turquoise halter neck was perfect. Mikaela is an athlete, and usually is more comfortable in shorts and sneakers, but when she slipped into her dress, she was transformed into an exotic goddess in a tropical sea- sophisticated…grown up…and quite beautiful. To me, a large part of the fun of finding the perfect prom clothing is watching this metamorphosis take place. When Abby was a senior, she and I went shopping for her gown. She tried on several, and we both fell in love with a pale blue strapless dress whose frothy skirt was delicately embossed with silver filigree. It was costly, but once I saw my daughter in it, I was helpless. Her green eyes were shining, and her cheeks blushed; her seventeen year old naivety bowing to the emergence of a young woman. Just as my parents had said yes to me, I had to say yes to her. She was sophisticated…grown up…and quite beautiful. Gabe’s prom was next, and although I had seen him in black tie before, I caught my breath when he emerged from his room. His tall, lean frame was accentuated by the cut of his rented tux, and he strode with the grace of the gentleman he was quickly becoming. It was amazing to me that a boy who had just yesterday slam-dunked dirty socks into the washer could overnight be transformed to this dashing young man. Somehow, he had become sophisticated…grown up…and quite beautiful. 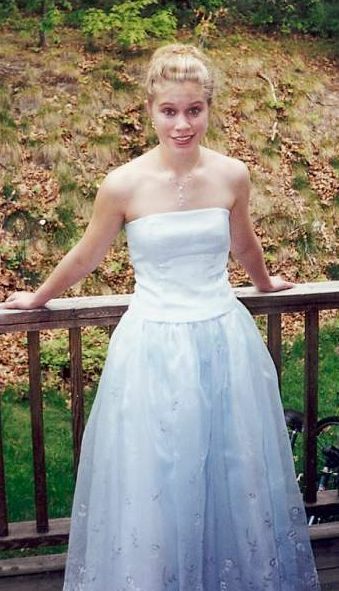 When Elizabeth reached her senior year, we shopped on a snowy Saturday morning for her gown. The driving was treacherous and the stores were practically empty. Elizabeth is tall and willowy, and looks like a runway model, so it was not long before several saleswomen were crowded into the dressing room to watch. My youngest child…my messy girl…disappeared into a dressing room, several gowns in tow, and emerged breathtaking and statuesque. The saleswomen oohed and ahhed, and we decided upon the ivory silk sheath with embellished straps. My messy girl was sophisticated…grown up…and quite beautiful. Prom is an event that marks the passage from adolescence to adulthood. It gives teenagers the opportunity to shed their childhood and slip into the vestments of respectable grownups- even if only for a few hours. It gives parents a glimpse into the future, to a day when their daughters will no longer be shy little girls and their sons will square their shoulders and look them straight in the eye. It is the middle of April, and prom season will soon begin. The halls of high schools are filled with whispers of who is taking whom. Young men are suddenly aware of how much money they need for tickets, and mothers and daughters fill the malls to shop for the perfect dress. Denim will be traded for tulle and heels will replace flip flops. Cameras will flash. Parents’ hearts will swell with pride. It is the season of metamorphosis, a time when skinny, uncertain, quavering-voiced adolescents become sophisticated…grown up…and quite beautiful. I read on the internet about a Florida elementary school where a second grader’s class photo was altered. The child, whose visage was replaced by a smiley face, had arrived at school without a signed permission slip, so the photographer covered his image with a cartoon smiley. While I agree that this might have been a tasteless solution, it did remind me that all kids look a little goofy in their school pictures- especially second graders. No matter how carefully they are dressed, how meticulously they are groomed, their pictures are bound to look as if they just rolled out of bed. In my second year of school, Michelle Peck snuck scissors to the girls’ bathroom and chopped her bangs off, right before it was time for Miss Makepeace’s class to go to the auditorium for pictures. I’m sure her parents were thrilled to see their little daughter with quarter-inch bangs sticking out straight from her forehead. I was equally thrilled to see my children’s school pictures. 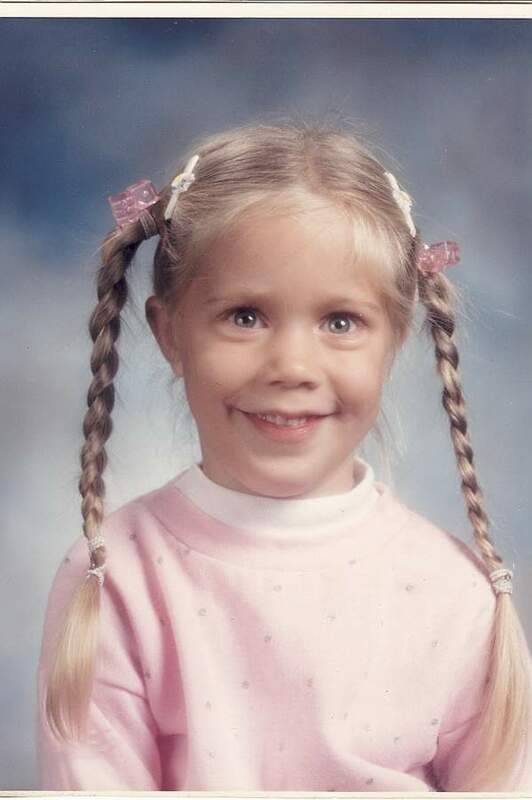 When Abby, my firstborn, started school, I had visions of her kindergarten photo to be a perfect study in pink and white. The morning that the pictures were to be taken, I carefully braided her hair, making sure her part was straight and her ribbons matched her outfit. She would be adorable! When the pictures arrived some weeks later, I hardly recognized my little cupcake. Her braids were messy and her ribbons were missing. Still, she did have that “I’m-so-excited-to-be-living” look in her eyes, and so I bought the pictures. 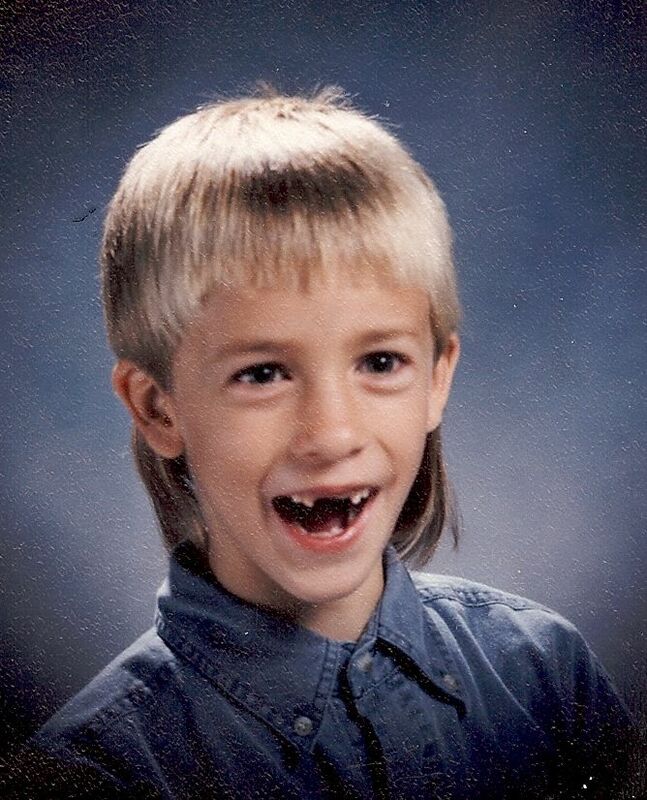 When Gabe was in second grade, half of his teeth were missing. This is not unusual; the tooth fairy spends the majority of her life visiting seven-year-olds. Either the photographer hated kids, or he hated teeth, because he certainly did nothing to minimize the jack-o-lantern effect. But when I looked at the photograph, I heard the peal of my son’s laughter, and so I bought the pictures. By the time Elizabeth entered elementary school, I was on to this school photography thing. I was also wise to my “messy girl.” No matter what I did, Elizabeth was always…well… messy. Five minutes after I finished getting her ready for school, I would find her soaring down the hill on her bike, tresses flying from her braids, shoes untied, purple popsicle dripping down one arm. I knew it was hopeless to dress her up for school pictures, so I sent her to school in her usual garb- jeans and tee-shirt. She was chronically ill- her little face pinched and pale- and I briefly considered brushing a little makeup on her cheeks to give her some color. I decided that a second grader didn’t need makeup and sent her to school just as she was. Several weeks later I found her pictures stuffed in the bottom of her back pack. There was my little wild child- toothless, ashen, and disheveled, and looking…well…exactly like my Elizabeth. Needless to say, I bought the pictures. At one point I thought I might replace the school photographs with ones I took by myself. One Easter Sunday the children were neatly dressed and combed for church. I ordered them sit on the couch while I shot photo after photo, trying to capture all three looking vaguely serene and well-behaved at the same time. Each time I snapped, someone would act up. Gabe would push Elizabeth. Abby would shove Gabe. Elizabeth would mug to the camera, and Gabe and Abby would fall off the couch, chortling with glee. I begged. I pleaded. I threatened. Finally, I gave up, resigned to the fact that every photograph in the house would look like my children were raised by wolves. Guess the school photographer wasn’t so bad after all. But here’s the funny thing. Now that my children are grown, my favorite photographs are not of serene, well-behaved cherubs. They aren’t the ones from a photography studio, with perfect lighting and perfect clothing. They aren’t the ones where the children sit demurely with Mona Lisa smiles. 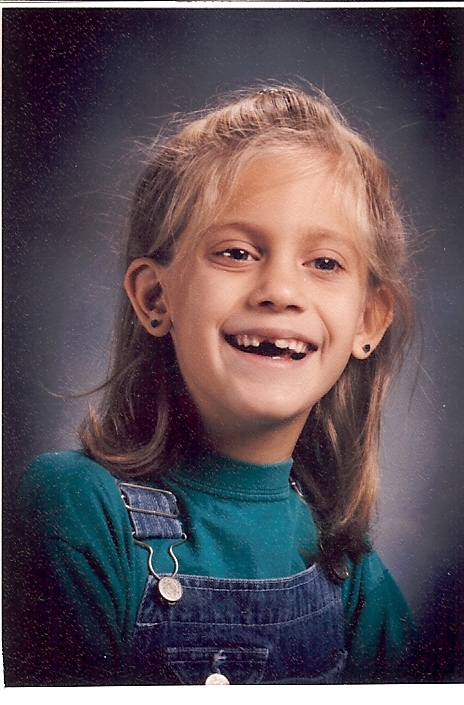 My favorite pictures are my kids as they really were- wide-mouthed grins, rumpled clothes, messy hair. Those photographs burst with an exuberance for life that only a child knows. They are unabashed, uncensored, unbridled. They are a silver moment in time, when the children I cherished were exactly who they were- no apology needed. The school in Florida is arranging to have another photo shoot. That’s a good thing, since that little boy will only be seven for one short year. I hope his parents sign the permission slip this time, so he can be included. But more than that, I hope his parents cherish his image with all the others of his class, no matter how toothless and messy they are. There will never be another moment exactly like this one. There will never be another child like theirs. A friend of mine who has two small children was telling me about taking care of them when they were sick. “I admit it. I used the T.V. as a babysitter.” He hung his head in embarrassment. I thought about this later. Although our conversation was somewhat tongue-in-cheek, the truth of the matter is, as parents, we feel obligated to respond to our children’s needs in text book perfection, and when we don’t, we feel guilty about it. I should know- the Queen of Guilt is also a quasi-expert on sick kids. My children were germ magnets. No matter how healthful their foods, how consistent their bedtimes, how sanitary their dwellings, I could not keep them from getting sick. Whatever caused pooping, puking or rashes, my children were sure to catch the bug and share it with the entire household. Ear infections, strep throat, asthma, croup and G.I. bugs were frequent visitors, punctuated by the less-frequent-but-more-powerful Chicken Pox, Hand, Foot, and Mouth Disease, Influenza, pneumonia, Scarlet Fever, Rotavirus and Mononucleosis. Finally, realizing that my defensive actions were having little effect, I decided it was time to abandon the defense and work on the offense. I devised the Momma G method of dealing with sick kids. Please note- these are not doctor recommended or pediatrician approved. I lay no claim to making your children get sick less or get better faster. This is merely a survival toolkit designed to help mommies and daddies get through those long lonely nights when the only sound is their two-year-old retching on yet another set of sheets. If your child complains of a tummy ache, do not take her into your bed. I made this mistake when Abby was eighteen months old and the pumpernickel bread she ate didn’t agree with her. Use your imagination. Popsicles are the perfect food. Pedialyte is doctor recommended, but it doesn’t help if your kid won’t drink it. 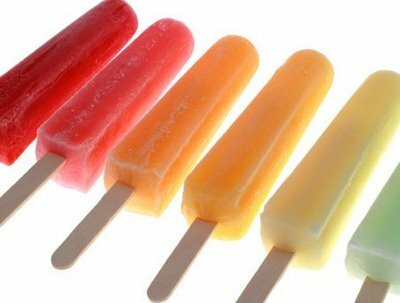 Sucking on a popsicle raises his blood sugar and allows him to replenish fluids a little at a time. Besides, the other kids in the family can have one, so they feel a little more special and a little less neglected, since all your time is spent on the sick sibling. Make a nest. When my kids were small and sick, I wanted them close to me so I could keep an eye on them. I would build nests out of blankets and pillows in the living room and there they would reside until they were up and about. Nests were only made on sick days, which made it special, and they were content to stay there while I did my household chores. It also helped when there were more sick kids than there was space on the living room couch. How your child acts is more important than what his temperature is. When we adults run a fever of 100, we huddle under the blankets and beg someone to put us out of our misery. When kids run a fever of 100, they use their blankets as capes and jump off the couch, pretending to be Superman. Conversely, when Gabe was three, he had his first bout with pneumonia. He was fussy and clingy at breakfast, but had no fever. By ten he was hanging onto me and crying, but still had no fever. By noon, he was having trouble breathing and wouldn’t let me put him down, but still had no fever. At his two o’clock appointment with his pediatrician, we found that he had a severe pneumonia, but still had no fever. I learned then that if your child acts really sick, he probably is really sick, no matter what the thermometer says. When your kid is sick, keep her home. Because Elizabeth had underlying health issues, a simple twenty-four hour stomach bug would put her in the hospital for a few days, and on the couch for several more. I found it infuriating to be at the church nursery and hear that the child she was playing with had been up barfing all night. Never underestimate the power of sticker books. 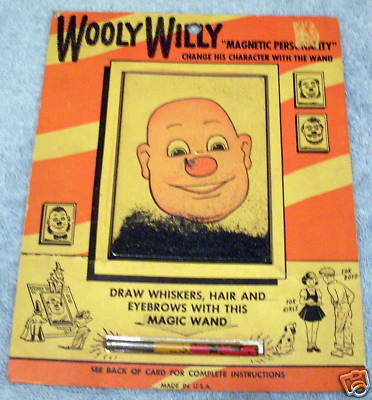 When I was a kid and sick, my mother stopped at Thorin’s Hardware Store and bought sticker books, Wolly Willy, and paper dolls. They made a week in bed with the measles a lot more tolerable. Although my kids never got measles, when they got sick, I made similar purchases- stickers, round tipped scissors and colored paper were a refreshing change from television when the children were confined to bed. 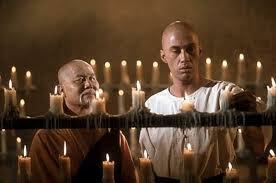 Besides, paper chains are much more entertaining than daytime dramas. Understand that hospitalizations impact the whole family. When Elizabeth was a little girl, she was frequently hospitalized. During those days when she was confined to bed, I was desperate to keep her entertained, so I allowed her to do things she ordinarily would not do, like paint in bed and dust herself, her teddy bear and me with baby powder. Her siblings visited her and found their little sister languishing in a no-rules environment and decided that life was grossly unfair that she got to be sick and they did not. When we returned home, there was always an adjustment period. Elizabeth whined when she no longer ruled the castle. The other kids accused me of favoring her and holding her to a different behavior standard than they were used to. Let’s face it-hospitalizations create chaos. Sleep deprived parents are torn between the kid on the ward and the kids at home. Nobody feels special. Sibling rivalry and jealousy abound. Everyone’s tired of eating Cheerios for dinner. You might as well recognize the elephant in the room, talk about it, and reassure yourself and everyone else that things will return to normal. Eventually. In the end, I did survive all the childhood illnesses my kids experienced. Now that they are grown, they take care of themselves if they are sick. My days of feverish babies and puking toddlers are behind me. I have earned my retirement from the bedpan brigade. And now I can rest in the realization that when I’m really old and feeble, payback’s going to be a … Well, let’s just say that sticker books aren’t going to do the trick. Sunday was April first and I was reminded of a rainy April Fools’ Day at the end of Dye House Hill. My sister Martha-Jean and I had run all the way to the bus stop in order to play a joke on our friends. As we stood in the drizzle, Martha-Jean pulled a small plastic bag from her pocket. 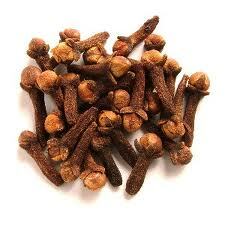 The bag contained whole cloves from our mother’s pantry. Taking a clove from the bag, she told the other children at the bus stop that they were candy and instructed them to put them into their mouths and bite hard. Ever the cohort in crime, I nodded in agreement, while the kids jostled to be the first to bite into a woody brown morsel. Soon, the group of children were gagging and spitting as the oil from the cloves hit their tongues and stuck in their teeth. Curiously, everyone laughed and thought it a fine prank. Thinking back on it, I’m not sure why they weren’t angry, but to them it was harmless and humorous, and no one was the worse for it. 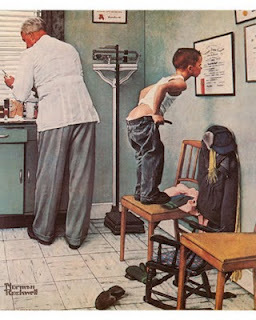 Children love practical jokes. I don’t mean bullying, or picking on someone smaller, or weaker, or less intelligent. I mean the kind of fun where everyone involved has a hearty laugh. 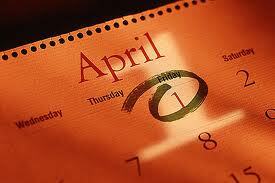 When my children were small, April Fool’s Day was a hugely popular holiday. I remember one year in particular, when they were quite young. The kids had heard their father tell stories about growing up in the Midwest and knew he had experienced several close encounters with poisonous snakes. Knowing how much their daddy detested reptiles, they drew and cut out paper snakes and placed them around the master bedroom while he showered. Then they sat at the kitchen table, snickering over their Cheerios, awaiting their father’s reaction. Their dad reentered the bedroom, saw their handiwork, and not wanting to disappoint them, ran through the house screaming“Snake! 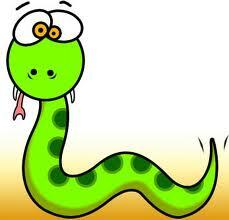 Snake!” as if he were terrified. The children chortled with glee, and yelled, “April Fool!” delighted that they had tricked their daddy, and he winked at me over his coffee, equally delighted that he had pleased his little ones. I might be wrong, but I think teaching children to have good-natured fun with each other is an integral part of their development. When Gabe was still only a baby, he found great pleasure in the absurd. While dressing him, I would put a sock on his head instead of his foot and he would convulse with giggles, relishing the unexpected. As he got older, he picked up on more subtle humor, noticing the asides and double entendres on Sesame Street. Now grown, he is witty and a bit snarky, and although he would rather plan a harmless practical joke, he doesn’t mind being the brunt of one. I’ve heard parents object to joking with children, fearful that they will injure their self-esteem, but I think that by teaching them fun and fair teasing, we can teach our kids that it is okay to laugh at themselves. True- some areas are out-of-bounds. I never joked about our children’s physical characteristics, or did things to make them appear stupid, or humiliate them. I never joked about things that the children felt were important. I never mocked them, or made fun of them. A joke is only a joke if everyone laughs. 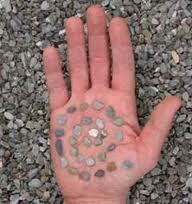 When Paul found the pebbles and message, he had no idea who left them, or how to respond. I waited several days and again left a few pebbles in his mailbox. Again, it drove him crazy that he did not know who left the cryptic message. For months, I snuck pebbles into his cubby, and he never guessed it was I. To this day, I cannot look at little white pebbles without thinking of Paul and the fun I had. In most instances I am indeed the mischievous perpetrator, but yesterday, I completely forgot it was April Fool’s Day. I was in Nashville, visiting my daughter Abby and her husband Johnny, when my cell phone rang. The caller was Gabe, who has a job as a resident director at a conservative university in Florida. He sounded upset and asked if I was too busy to talk. I remembered what pranks were like when I was a college student. They easily could be carried a few steps too far. “Uh oh,” I thought. Gabe usually has better control over his temper, but I know he’s been working long hard hours. “Maybe he’s been more stressed than I knew,” I mused. “The Vice President of the college is on his way to see me. I think I really messed up this time. I may lose my job. I mean, I hit a student!” His voice was flat, discouraged, worried. My mind went into instant Mom mode. In a nano-second I took stock of my finances, calculating how much it would cost to fly to Florida and help him move back to New Hampshire. Before he finished his sentence, I had figured out how to rearrange the apartment to make room for his stuff. He would need support now, not chastisement. There would be time to talk out alternatives to violence later. “You know what I’m going to say when he gets here?” Gabe asked. “Gabe, don’t make things worse,” I thought. “What?” I said aloud, dreading his hotheaded response. “I’m going to say… ‘April Fool’!” He burst into laughter. Sometimes I think I should have raised puppies.